This isn't a great photo but I'm pairing it with some pretty awesome finds! Last week I found 2 vegan burgers that my local ALDI is now carrying! 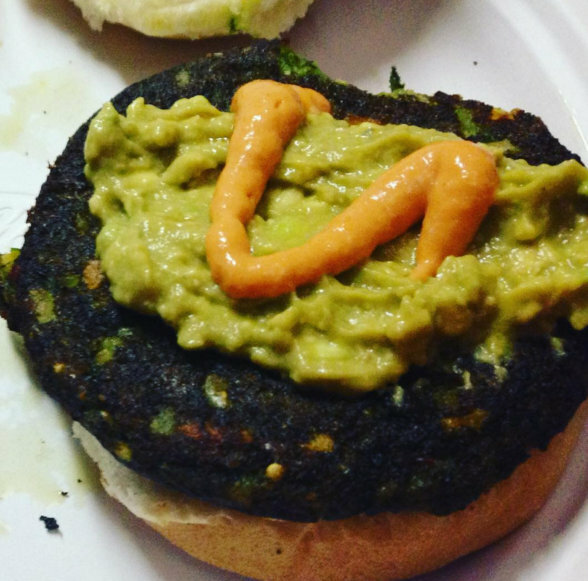 One was simply called the Vegan Vegetable Burger and the other was a Spicy Black Bean Burger that did NOT contain animal ingredients in it. This past weekend I spotted yet ANOTHER vegan option that they are now carrying. This one is a Kale Burger and it is clearly marked VEGAN. YAY...Aldi! I topped it with a Vegan Mayo I made myself at home and a squirt of Sweet & Tangy Peach Haberno Sauce I found at another local shop that just so happens to be vegan, too! REMEMBER...MidWeek Munchies is BACK! Join in! Link up below with ANYTHING Vegan...grocery hauls, product reviews, farmers market trips, recipes, restaurant reviews, newly found websites or blogs...YOU CHOOSE...you LINK up! YOU ROCK! Ooh, I hope those burgers reach Aldi in the UK. Really glad to see mid week munchies is back. Thanks for the encouragement on getting the MWM back up and running again! I love the idea of avocado mayo, sounds good. I loved ALDI when I lived in PA. I was surprised at home much it tasted like it. I was able to find Just Mayo here for MONTHS and now I can't...figures...but now I know this little trick! We don't have Aldi in Seattle — yet. I think I read something recently that Aldi was increasing their organic selection and was poised to become the next Whole Foods rival, but with lower prices! It's funny my little area actually has this chain...usually we are the last to get any chain! LOL I read an article that ALDI is a sister company of Trader Joe's! This is so cool! I would gladly buy these burgers if I could find an Aldi around here... Hopefully the chain continues to thrive and grow, spreading vegan goodies all along the way. I heard they are growing! Not sure what new stores are popping up! Perhaps I will blog about that since so many people made comments :) Thanks for the idea! Ahhh no way! I keep reading all this stuff about vegan things at Aldi, I REALLY need to give it a try! They are getting more and more vegetarian, vegan, gluten free, and organic options!!!! They do have a more bitter taste than other veggie burgers I have tried but to me that makes sense because Kale is more bitter usually and I like that about Kale! I'm not sure if I will buy the black bean ones again. I might try these once and a while if we are camping! These burgers sound great, I am a fan of anything kale and really do not notice the bitterness in kale at all anymore. The vegan may recipe looks great too, thanks! Sweet! It is so cool to see some vegan foods at Aldi! Yes!!!!! I often do a happy dance when I see vegan items there! Oh your homemade mayo sounds great! I tend to buy store bought vegan mayo, would prefer to make my own. And the kale burger!!!! Nice! I was staring at the Kale Burgers in the freezer this morning. Might have to have them tonight to finish them! Aldi kale burgers are yummy!!! They were all gone the other day, I am so sad, I hope they will get more in. The avacado mayo looks yummy also. Thanks for stopping by and commenting! I know what you mean about getting hooked on something and them not having it again! So frustrating!!!! Let me know if you try the Avo-Mayo!